In an era where every gadget company is looking to hop into the future, Kodak plans to relive the old times. The stalwart camera giant, Kodak, which is a name synonymous with perfect moments, has reinvented the wheel by introducing its special line of cameras and printers. The Smile Classic Instant Print Camera is one great addition to their repertoire. So, What Is Kodak Smile Camera All About? By introducing instant cameras, Kodak plans to make users switch to traditional method of clicking pictures. The Smile cameras from Kodak will instantly print out a picture that you take. Technically, these cameras will bridge the gap by providing a middle ground between traditional manual photography which was way too slow and the more advanced digital photography which is way too quick. Notably, the product comes equipped with special features. This device is provided with a separate viewfinder, a timer, and a flash. So, you can either click the pictures by seeing through the viewfinder or set up a 10-second timer and get the picture as a selfie. And finally, you could also use the flash to get good low light photographs. To top it off, the instant Smile chain of cameras is also provided with a micro SD card in order to save all the clicked photographs. But most importantly, the product aims to bring back the essence of physical, printed pictures back into our lives. The photographs are printed out instantly in this Smile line of cameras. What comes out of this little printer is a set of pictures that are 3.5-inch x 4.25-inch in size and the print quality is pretty impressive as well. Kodak has also added another important functionality in this camera. How often have we wished for the photographs taken on the smartphones to be printed out on paper? Well, with this instant camera, you can do that as well. 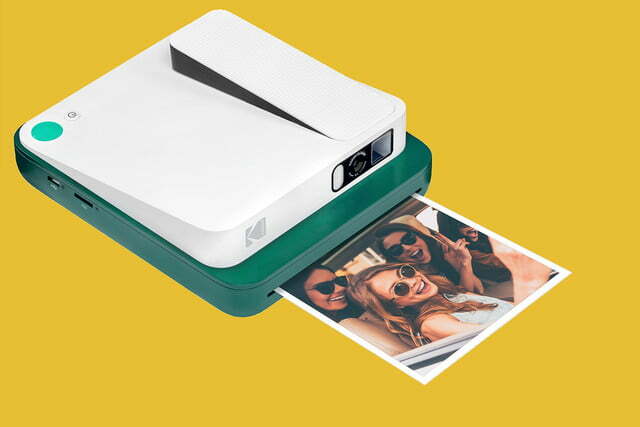 It acts as a mini printer that can print the pictures taken on your phone. All you have to do is make use of the Kodak Instant Print Connection App, connect the phone to the camera via Bluetooth and you are good to go. You have a printer with you on the go! There is also another version to this instant Smile camera from Kodak. In fact, this is a smaller version backed with a 10 MP camera which is known as Smile Instant Print Digital Camera. With the help of the ZINK Zero Ink Printing Technology, this camera also prints out pictures instantly. In fact, all thanks to the adhesive backs of these photographs, you can stick them around, anywhere. The LCD viewfinder, the 10-second flash, and the microSD card are the same as the Smile Classic Instant Print. In addition, you can insert some filters before printing these pictures. Previous Post« Previous 8K Video and R System Roadmap from Canon?